Hearts manager Craig Levein has hit back at Michael Stewart after the pundit branded his handling of striker David Vanecek as “poor management”. Levein substituted his new signing just 34 minutes into Wednesday’s 2-1 defeat by Dundee, later describing Vanecek’s performance as “rubbish”. He also revealed that the Czech forward was lacking the necessary fitness. 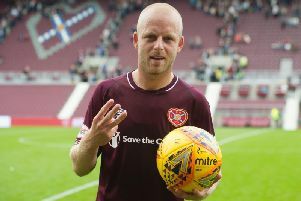 Former Hearts midfielder Stewart, who had a spell under Levein at Tynecastle, said that the manager’s public criticism of the player was all wrong and that he had managed the player poorly. The pair have clashed previously, with Levein accusing Stewart of having an “agenda” and “a personal vendetta” against him. Asked about Stewart’s criticism, Levein said: “Listen, I’ve got to laugh. My good friend Mr Stewart is not intelligent enough, or brave enough, to try management. Why would I take any advice from him? “It’s like me taking advice on politics from somebody like, I don’t know ... Michael Stewart?